One of the prevailing developments in wedding planning, over the last few seasons, has of course been the whole "do-it-yourself" trend. So we're always on the lookout for easy, fun and affordable ways to get you DIY-ing - invitations being the obvious starting point; it's the first thing you need to organise, as soon as you set your wedding date! When it comes to DIY invitations, there are a number of great options available to Canadians, online or locally, custom, even digital; but the preeminent quick-and-easy, affordable-yet-great-looking solution has long been Wilton's "Print Your Own" line. How Wilton Print-your-Own DIY works.. 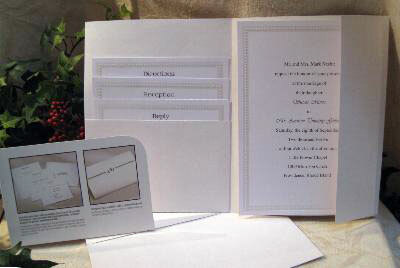 They are a simple and fast "plug-and-play" option to creating beautiful and professional wedding invitations on your own. 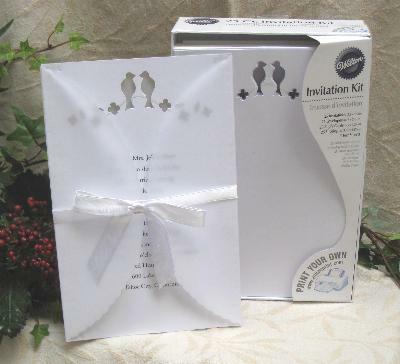 Each kit contains everything you need to get going, from the invitation to the reply itself. Wilton also provides the templates, the wording and the fonts; so all you have to do is download the appropriate information from their website and print from the comfort of your home (using an inkjet or laser printer). 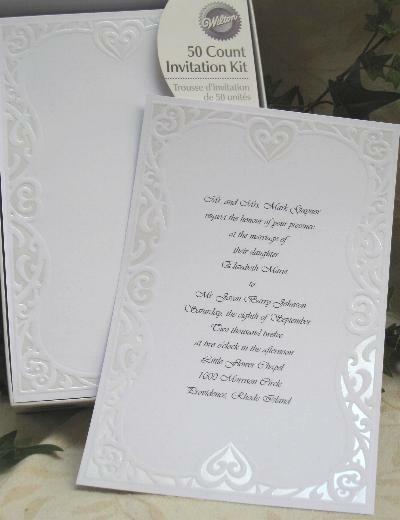 These invitations are available in a multitude of styles ranging from the simple to the embellished. 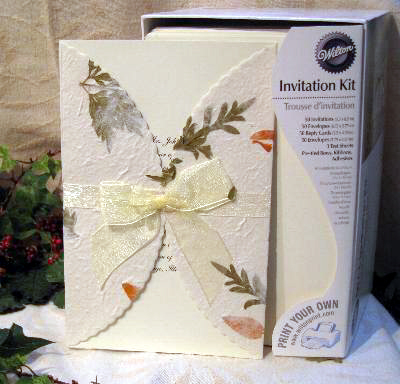 Plus, each box contains all you will need for the invitation assembly. For example, if the sample showed the invitation having a bow, the box will contain pre tied bows ready for you to stick onto your invites with the foam squares that are also included! 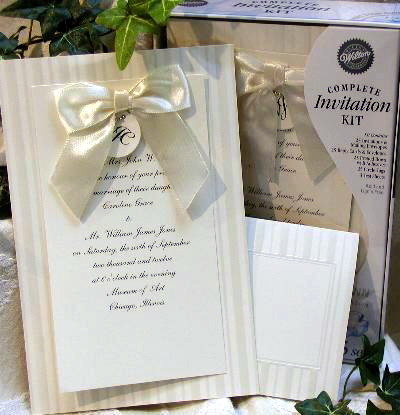 The ever popular pocket style invitations with multi-purpose cards are also offered by Wilton. 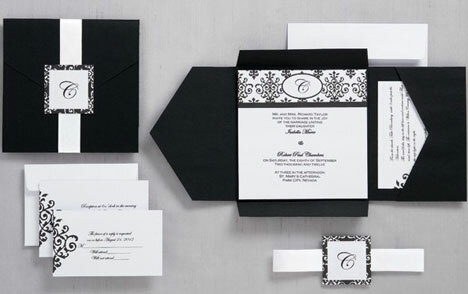 "Pocket invitations are invitations that feature the wedding invite but that also have a side pocket where additional cards and envelopes are housed.".. The extra cards come in three sizes so one can sit behind the other and be seen when inserted into the pocket. The smallest card is used as a reply card while the other two often serve as cards for maps, available hotel accommodations, reception instructions, general info, etc. How to use Wilton Invitations? 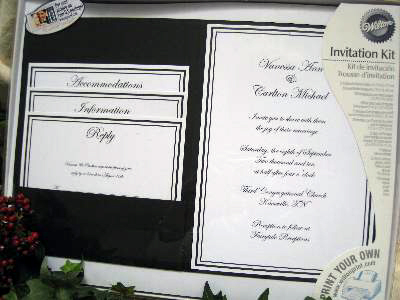 The blank invitations and reply cards you receive with your kit require wording. 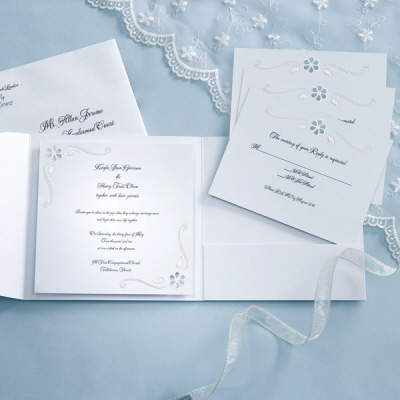 You can use Wilton's website to find the perfect wording and template for your invitations. Or, you can enter your own wording. 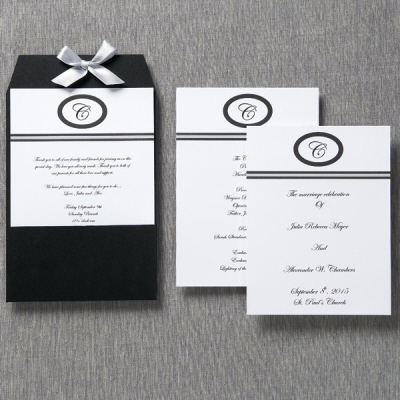 When everything is selected, simply print your invitations. Wedding programs and thank-you notes are also available for printing through Wilton's. 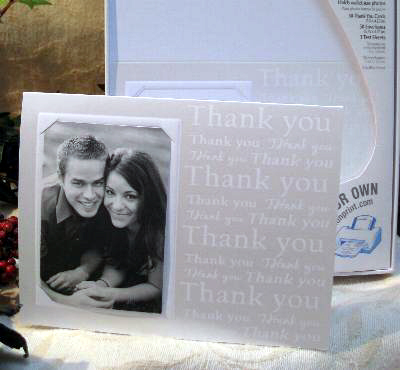 They even produce a photo thank-you note that holds your wedding photo in a card. You can either print your thank-you on that card from your computer or write it by hand. Based on The Thank-You Company's current (Winter 2011) pricing..
boxes of 50 plain styles or boxes of 25 embellished styles (with bows, vellum overlays, ribbons, etc.) are just $30.00 each. Boxes of 25 pocket style invitations are $40. (*) Please note, pricing from other retailers, or at the time that you are reading this article! may be different. For a local retailer, in your city (or to price shop!) browse through our wedding invitation suppliers listings.